The fifth major update to Mac OS X, Leopard, contains such a mountain of features — more than 300 by Apple’s count — that it’s difficult to boil this $129 operating system release down to a few easy bullet points. Leopard is, at once, a major alteration to the Mac interface, a sweeping update to numerous included productivity programs, a serious attempt to improve Mac OS security, and a vast collection of tweaks and fixes scattered throughout every nook and cranny of the operating system. As with every OS X update since version 10.1, there’s no single feature in Leopard that will force Mac users to upgrade immediately. Instead, it’s the sheer deluge of new features that’s likely to persuade most active Mac users to upgrade, especially since this is the longest gap between OS X upgrades — two and a half years — since the product was introduced. Sure, some items on Apple’s list of 300 features might seem inconsequential, but if even a handful of them hit you where you live, that will be more than enough motivation for you to upgrade. Apple trumpets the interface changes in Leopard as “stunning” and “eye-opening,” but in reality the changes are a mixed bag. First, the good stuff: After years of experimenting with different looks for windows, sidebars, and other interface elements, Apple seems to have settled on a fairly consistent interface. The color scheme is largely monochromatic—shades of gray with slight gradients. Apple has improved the contrast between the frontmost window and the rest of them by increasing the top window’s drop shadow and dramatically lightening the color of inactive windows. The Leopard Finder’s new sidebar, clearly modeled after the iTunes Source List, is better organized and more usable than its Tiger counterpart. 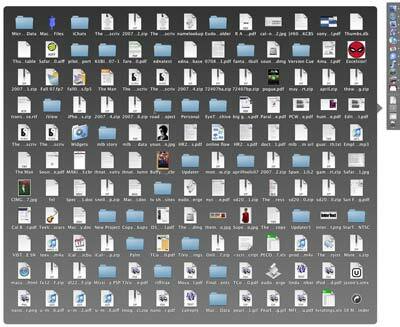 When it comes to folders containing lots of documents, Stacks is not as useful. Unfortunately, some of the changes are not as successful. The Mac’s trademark menu bar, which spans the top of the screen, has been made semi-transparent. When the desktop is set to display an image with both light and dark areas, the see-through menu bar is visually striking. Unfortunately, that aesthetic choice comes at too steep a price: the areas of light and dark behind the menu bar can severely decrease the readability of menu items. Apple has modified the Dock, OS X’s built-in program launcher, so that the Dock’s icons appear to sit on a reflective glass tray when the Dock is positioned on the bottom of the screen. (Someone must’ve pointed out to Apple that the metaphor broke down when the Dock is placed on the sides of the screen; in those orientations, the Dock’s background is a simple half-transparent gray.) A pleasant glowing light appears next to the icons of currently-running programs, although the light is a bit too subtle when the Dock is positioned at the bottom of the screen. Unfortunately, the Dock’s new Stacks feature is a mess, replacing a utilitarian approach to stashing folders in the Dock (click to open the folder, click and hold to see a list of the folder’s contents) with a snazzy but generally less useful pop-up window featuring a stack or grid of icons. A potential feature touted during earlier demonstrations of Leopard — the ability to drag an arbitrary collection of items into the dock to make a temporary stack — apparently didn’t make it to the final version. The most important new feature added in Leopard is undoubtedly Time Machine, Apple’s attempt to encourage the vast majority of users who never, ever routinely back up their data to change their ways. 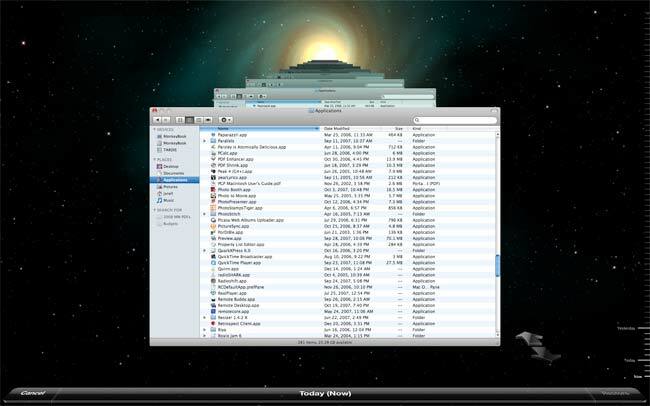 Time Machine automatically backs up a Mac’s files to a separate hard drive (internal or external, though external is certainly safer and more convenient) or a network volume being shared by another Mac running Leopard. Attaching a drive and assigning it as a Time Machine backup volume is incredibly easy, and once you’ve set it up, you can essentially forget all about it. Time Machine's interface looks a bit spaced out, but it makes incremental backups understandable. Perhaps the most impressive feature of Time Machine is its support for incremental backups. Rather than creating an identical copy of your drive, it tracks the files you’ve changed and saves those changes on an hourly basis. And grabbing an old copy of a file isn’t some complicated job designed for an IT professional; with one click on the Time Machine icon you’re in the gratuitously spacey Time Machine interface, which lets you use the Finder (as well as other supported applications such as iPhoto) to fly back in time and pluck out the data you want to retrieve. It really is backup for regular people, and the presence of Time Machine leads to a remarkable change in mindset: I just installed a new version of a program I’m beta testing, and realized that if it didn’t work, I could quickly roll back to the previous version via Time Machine. One downside of Time Machine’s backups is that they’re not bootable on their own. If your main hard drive dies, you need to replace the drive and then rebuild your drive by using the Leopard boot DVD's Restore function or the Migration Assistant utility. But all your files will be there when you’re done. Will Time Machine turn us all into compulsive back-up fanatics? No, because making that backup requires actual storage space, which requires the purchase of a large backup drive. But until online storage is infinitely vast and fast, that will always be an issue. The good news is, Time Machine is simple enough that it really eliminates most of the obstacles that cause most people to bypass backing up their data. If you can buy a big hard drive and plug it into your Mac, you can keep your data safe. It’s been 18 months since Boot Camp, Apple’s method of allowing Intel-based Macs to boot into Windows, was released as a public beta. Boot Camp serves a useful purpose in that it provides basic Windows compatibility and the ability to run Windows programs at native speeds. However, most people who want to run Windows software on their Macs will opt for tools such as VMware Fusion and Parallels Desktop, which allow Windows and Mac OS X to operate simultaneously. Still, the importance of Boot Camp can’t be understated. Its mere presence provides a basic level of Windows compatibility that many potential Windows-to-Mac switchers will find comforting. Multiple-workspace utilities, which let you switch between various collections of application windows in order to reduce clutter, have been around for years on numerous platforms, including Mac OS X. Leopard’s new Spaces feature is an attempt to bring the concept of multiple workspaces to a much wider audience. While it’s certainly promising, in the initial release of Leopard I found it to be a bit erratic. Spaces has been integrated smartly into OS X’s existing Exposé feature, another tool for organizing a large number of windows. The concept of Spaces is that the Mac’s interface is actually a series of workspaces, located adjacent to one another on a grid. To drag a window out of a cluttered workspace and into a pristine one, you just drag the window to the edge of the screen and, after a momentary pause, the existing space will disappear and the window will appear by itself. Pressing the F8 key invokes an Exposé-style zooming feature, that reveals the contents of all the spaces and their spatial relationship to one another. A four-workspace, two-display set of Spaces. I’m not convinced that multiple workspaces are ever going to be a mainstream feature, but they can be a huge productivity boost to busy power users. And Apple’s implementation is quite nice, allowing you to assign individual applications to specific spaces or to every space (a feature I used to make sure that my DragThing dock and iChat windows followed me wherever I went). However, Spaces does have some quirks. I found that sometimes windows would appear in spaces that I didn’t expect, for reasons that I couldn’t fathom. Some of my third-party applications became quite confused until I set them to appear in every space. Sometimes I would launch a program in one space and move to another space, only to find that program’s windows appearing in my new space. Still, Apple should be credited for bringing such a geeky feature to a broader group of users. While Spaces might never become a feature that takes the world by storm, it does have the potential to dramatically improve the productivity of many users who would never have downloaded a third-party workspace utility. Quick Look, which appears throughout Leopard, is a technology that lets users preview the contents of documents without opening the program that was used to create them. Click on a Microsoft Word file in the Finder and press space, and the entire file will appear before you, ready to be read (but not edited). Select a movie and press space, and the movie will expand and begin to play. 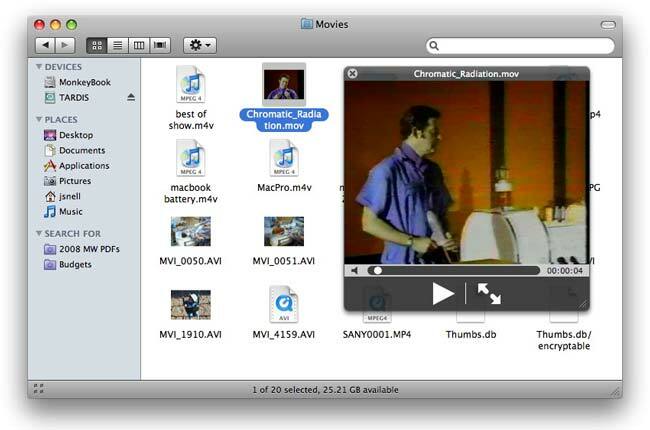 Quick Look can play back QuickTime movies without launching QuickTime Player. That same Quick Look technology lets you optionally set Finder views to display live previews of documents. Spotlight and the Open and Save dialog boxes are also Quick Look savvy. And the Finder’s new Cover Flow view really wouldn’t be possible without this technology, which transforms dull document icons into live previews of each document’s contents. In practice, turning your Finder icons into live document previews isn’t always very useful — text documents end up looking like a wash of gray. But Quick Look itself is an impressive technology, if longtime users can retrain themselves to press space rather than double-clicking on a document to see what’s inside. In addition to the new features introduced in Leopard, this operating system release includes major updates to numerous existing programs that are included with Mac OS X. The marquee feature of Leopard’s predecessor, Tiger, was Spotlight, a desktop search engine that indexed the contents of all your Mac’s documents and made them instantly accessible. It made for a great demo, but in everyday use Spotlight was a real letdown. It was slow, couldn’t handle sophisticated queries, and failed to support the simplest query of all (namely, searches for a file with a specific name). With Leopard, Apple seems to have addressed most of Spotlight’s failings. It’s shockingly faster than it was in Tiger, and Spotlight now supports Boolean operators (and, or, and not). There’s also better support for saved searches and for searching files on networked Macs. Mac OS X’s built-in calendar program, iCal, is now five years old, but Leopard’s iCal 3.0 is the first version that doesn’t feel like a toy. The iCal interface is more straightforward and responsive, and the ability to edit entries by double-clicking on them eliminates the unwieldy Get Info pane of previous versions. iCal 3.0 also supports the CalDAV standard for group calendaring, which threatens to turn iCal into a true business tool. Unfortunately, we weren’t able to test these features on a CalDAV server (one ships with the server version of Leopard, and since the server is based on an open-source server framework, the streets will likely be littered with CalDAV server implementations before too long). iChat's new tabbed interface, with a chat displayed in the new Compact display option. Apple’s iChat IM client has also received an excellent update, addressing almost all of the program’s flaws. Audio chat sound quality, which previously lagged sadly behind Skype’s, is noticeably better. It’s much easier to manage multiple chats via a tabbed chat interface (previously only available in iChat via an add-on such as Chax ). 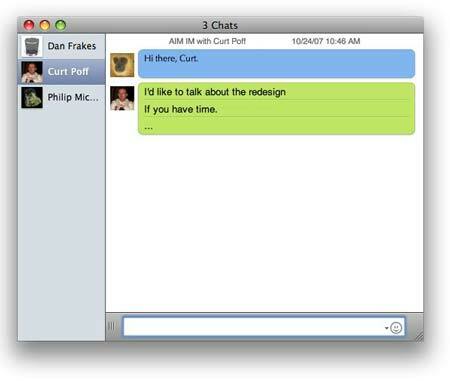 And perhaps most importantly, iChat now allows you to log into multiple AIM accounts at once. All that’s missing now is support for competing chat services such as those offered by Yahoo and MSN. Apple Mail 3.0 has also seen numerous improvements, although perhaps the biggest one is the improved speed of Spotlight, which makes searching for messages within Mail much less painful. Mail also now has support for to-do lists and “notes,” in which you leave messages to yourself. Mail seems to be an odd place to stow this information, and the to-do interface in Mail is poorer than the one in iCal. Although Mail’s notes look a lot like the notes on the iPhone, the two don’t sync. Another out-of-place Mail feature addition is support for RSS feeds, which are already supported in Safari and numerous third-party feed-reading programs. But Mail’s interface is actually quite conducive to RSS reading, and I found reading RSS feeds in Mail to be enjoyable. It’ll never be appropriate for heavy RSS consumers, but for casual RSS users it really hits the spot. OS X’s included Preview utility is probably the most unheralded productivity program in OS X. (By default, it’s the tool that opens images and PDF documents when you double-click on them in the Finder.) But it may be harder for Preview to remain a secret now that it’s been given a major facelift with Leopard. Preview 4.0 gives Acrobat a run for its money when it comes to basic PDF features, improving support for PDF annotations, improving searches within PDF documents, and providing built-in tools to reorder pages and combine PDFs into a single document. Preview’s image manipulation tools have also improved, including the addition of the “Instant Alpha” background-removal tool that Apple first introduced in iWork ‘08. The Dictionary utility has added support for Wikipedia as an additional information source, and it’s nicely integrated into the application’s interface. For everyone who hasn’t abandoned DVDs for the wonders of the iPod, DVD Player has been completely overhauled, giving users much better control over navigating DVD content, including a TiVo-like jump-back feature. And Front Row, which replaces the Mac interface with a remote-control driven menu system for navigating iTunes content, has been updated to use essentially the same software as the Apple TV hardware device, meaning any Mac with an infrared sensor and Leopard can play back music and videos using the slick Apple TV interface. 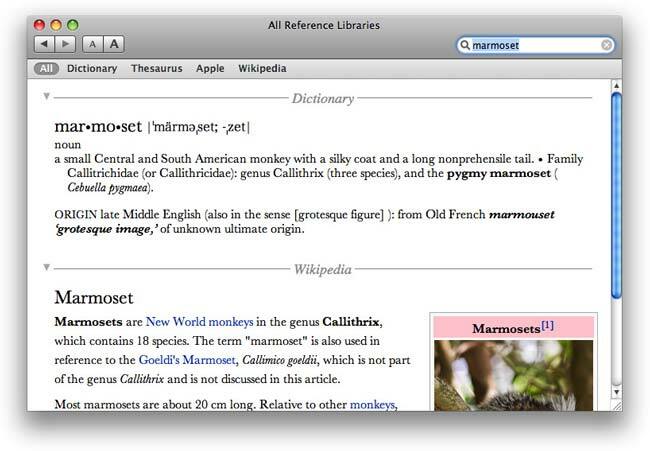 Wikipedia adds a depth of information to the built-in Dictionary utility. The introduction of the Automator utility in Tiger suggested the promise of regular users taking advantage of automation technologies previously limited to people who knew their way around scripting languages such as AppleScript. As it turned out, Automator was pretty cool — but once you wanted to automate more complicated tasks, you’d run into its limitations pretty quickly. In Leopard, Automator has been updated to address its two greatest limitations: you can now set and read variables during a workflow, and you can set a workflow to loop. Automator also now has a Record feature, which lets you record yourself performing certain tasks and then integrates those tasks into an Automator workflow. Finally, Leopard shows remarkable improvement when it comes to handling networking issues. It’s much easier to dismount remote servers, and attempting to access a server that’s disappeared no longer causes an interminable wait. (That’s an issue that should have been resolved by Apple long ago, but at least with Leopard it’s finally been addressed.) The Networking preference pane has also been updated with a better-organized interface. Mac OS X and its users haven’t yet felt the sting of a major hacker attack, but in the two years since the release of Tiger, Apple and other technology companies have come under increased scrutiny about the relative security of their products. And Leopard includes a large number of new features that specifically address security concerns. Most regular users won’t notice the fact that several Leopard applications are “sandboxed” with restricted access privileges that make them less likely to be used as tools in a hacker attack. Nor will they realize that Leopard now uses a shifting system of assigning memory spaces in order to make it impossible for hackers to bank on the presence of specific code in a specific area of a Mac’s memory. What they will notice is that when they first attempt to run a program they’ve downloaded from the Internet, they’ll be prompted with information about when they downloaded it and what program was used to download it. Apple has done a good job of making its security messages more understandable to regular users, which is good, since most users will simply click through a dialog box that makes no sense. It’s impossible to detail the avalanche of new features in Leopard. Screen Savers and international spelling dictionaries aside, Apple’s list of “300+ new features” isn’t far off. If you use Photo Booth, Parental Controls, Image Capture, VPN, Terminal, or just about any other feature you can think of in Mac OS X, you’ll find at least some changes. So are 300-plus new features worth $129? That answer will vary, because no single user will ever take advantage of all — or maybe even half — of those 300 features. But given the impressive value of Time Machine and improvements to existing programs such as iCal, iChat, Mail, and the Finder, most active Mac users will find more than enough reasons to consider that upgrade cost money well spent. Despite a few interface missteps, particularly when it comes the menu bar and the Dock, Leopard is an upgrade that roars.